The year was 1940 and a young attorney wins the election for District Attorney in the Ninth Judicial District in New Mexico. This young attorney, E.T. Hensley, selects my grandfather, J.V. Gallegos, as one of his Assistant D.A.’s. It was an exciting big step in a budding law career for my grandfather. Many cases that he would soon find himself working on tell a wide variety of tales including murder, betrayal, families and most of all, friendships in the local community. They are fascinating stories of the human condition. It became more obvious as I read through them that he was intrigued in challenge of trying to find the answers and learning more about people. His love of the local community also shines through. I remember right before I left to Hunter College in New York City for a stint, he wasn’t thrilled about my plans on leaving, but said, “Okay, go. Learn all you can where ever you go, but come back to New Mexico. Work here. New Mexico needs you.” I didn’t get it at the time, but now I understand because that is exactly what he did. He got his law degree in St. Louis and came back to New Mexico because he loved serving the state and his local community. 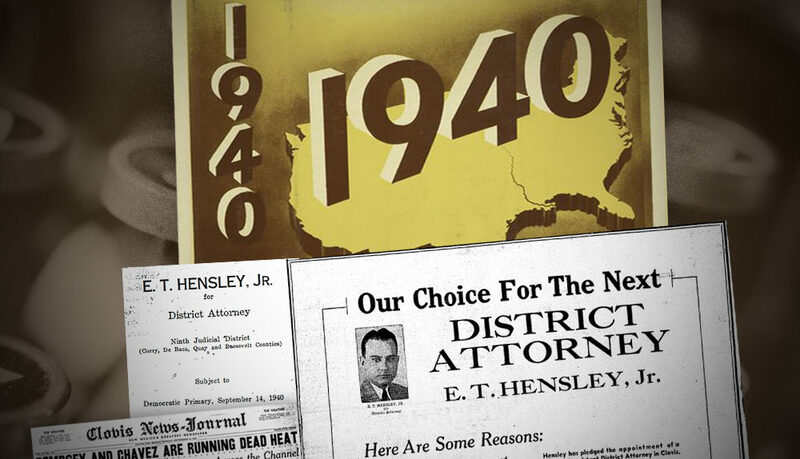 In the fall of 1940 there was an election for District Attorney in the Ninth Judicial District. Four counties, Curry, Quay, DeBaca and Roosevelt comprised the district. J.C. Compton had been assistant district attorney and district attorney for around twenty years. 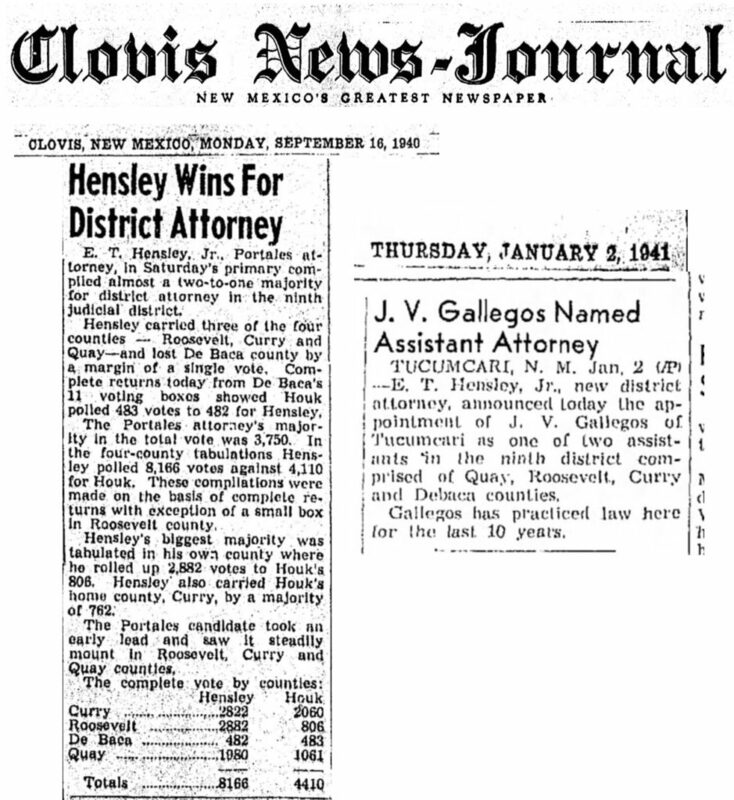 A young lawyer from Portales, E. T. Hensley, Jr. announced and ran against Compton in the Democratic primary. In the primary there were no Republicans running. The district was composed mostly of democrats. 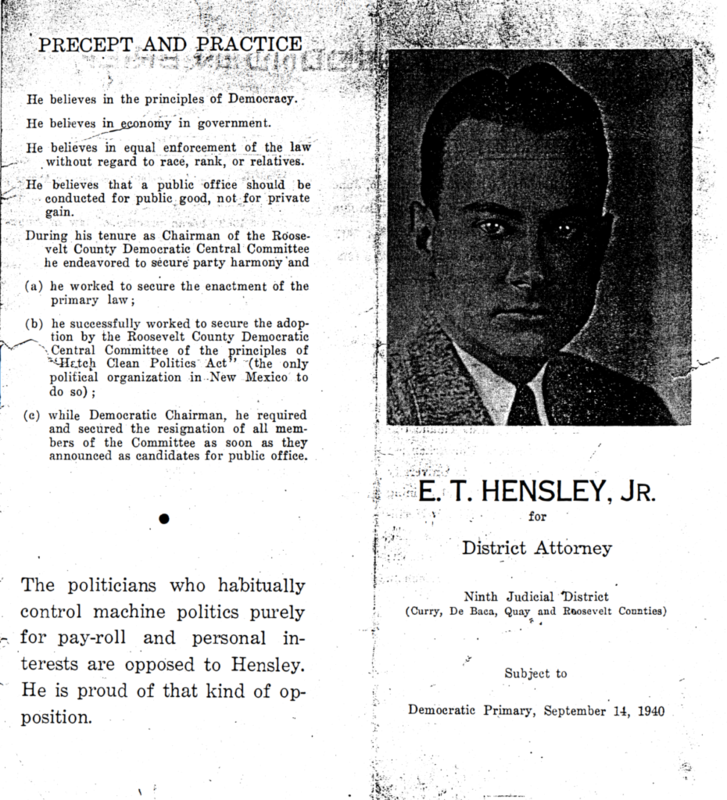 Hensley was a doctor’s son. Compton, at a public meeting during the campaign, accused Hensley of being born with a silver spoon in his mouth. Hensley stood up and said. “I don’t know if I was born with a silver spoon in my mouth, but I know that Compton has had his hand in the tax payer’s pockets for the past 20 years!” Later Compton withdrew from the race and a man by the name of Hauk entered the race. On January 1, 1941. E. T. Hensley Jr. was sworn in as District Attorney. He was entitled to two assistants. He appointed Richard Rowly of Clovis and me, J. V. Gallegos of Tucumcari, as his assistants.